Fireflies usually light up their body to attract comrade and prey. There are around 2,000 species of fireflies but only a few of them have the ability to light up their body. 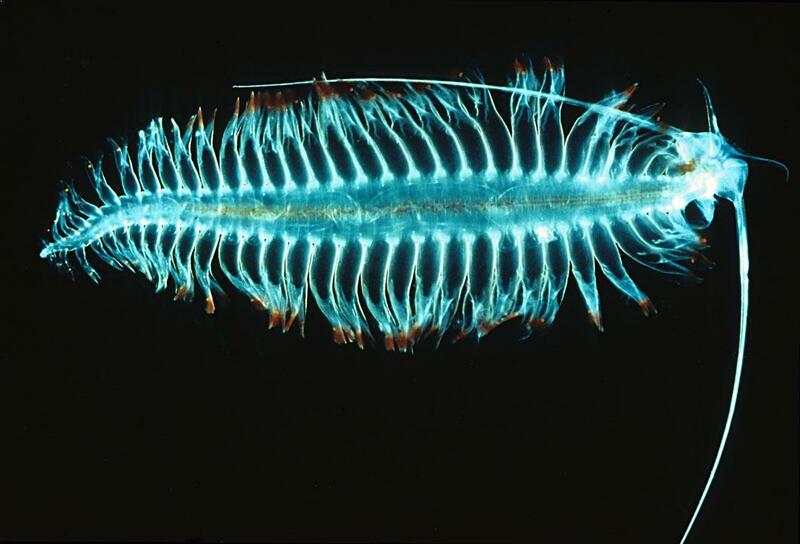 There is a light-producing chemical reaction in all bioluminescent animals known as bioluminescence. The chemical reaction depends on an enzyme called luciferase. Most of the bioluminescent species are marine animals, Fireflies is one of the terrestrial species capable of producing light. Bioluminescence needs calcium, adenosine triphosphate, chemical luciferin and luciferase inside the light organ of an organism. When the combination is being introduced to oxygen it automatically triggers a chemical reaction that produces light. The species can reach upto 0.2 to 1 inch in length. Talking about the appearance, they have a black body covered with yellow or orange markings. Also, they have a pair of leathery forewings known as elytra that cover membranous wings, however, some of the female fireflies are wingless. Sometimes when they gather in groups they produce light at the same time. One of the terrifying deep sea creatures, Anglerfish are usually seen 2000m deep inside the ocean. It is also known as humpback black devil or Johnson’s anglerfish. They love to swim in mid-water and to attract its prey they light up their strange antenna known as lure situated at the top of the head. The lure can also be moved around just to attract prey and then it can be swollen with the help of their largemouth. The lightning in lure comes from small bacteria called phytoplankton. Anglerfish can be seen in the Pacific, Atlantic and Indian Oceans. Female Anglerfish are much bigger than males. It can grow up to 1.2 meters long while the males can only be 1 cm long. Anglerfish lives often in groups, however, adults live a solitary life. Large fishes and humans are natural enemies of angler fish. Female used to produce 100 to 1000 eggs per season and they lay eggs in neat rows. Both the parents guard the eggs and protect their offspring. The average life span of the species is approximately 10 to 15 years in the captivity. One of the most beautiful jellyfish in the world, Crystal Jelly has a shallow umbrella-shaped body. It is one of the most beautiful bioluminescent animals that glow blue-greenish. Crystal Jelly loves to eat copepods, comb jellies, and other jellyfish. It has bioluminescent tentacles that allow her to light up its body. Crystal jellyfish has very good control over the movement of his body and uses its energy to control it’s movements if there is a risk of a predator or if there is a lack of food. They use their sticky tentacles to inject venom into the prey and can eat animals twice of their size. Crystal Jellies are an almost completely transparent animal on planet Earth. Crystal Jelly is clear in appearance, howvever, it grows greenish-blue and later it grows upto 10 inches in diameter. They used to expand their mouth to eat prey upto half of their size. Scientists and researchers were rewarded Nobel Prize for in 2008 for the discovery and development of a protein found in crystal jellies. It is also known as Atolla jellyfish. It can be seen in almost all the oceans around the world. Atolla jellyfish is deep red in color. Coronate Medusa has 20 marginal tentacles on the body and one large hypertrophied tentacle compared to marginal ones used to capture prey. Atolla jellyfish is one of the Bioluminescent animals on planet Earth because when attacked it launches a series of flashes that attract predators who will more interested in attacker than the jellyfish and hence it is also known as “alarm jellyfish”. You will also find interesting reading about aquatic animals with mind-blowing superpowers. The species reproduce in two different ways, firstly, they can reproduce asexually like many other jellyfish species. During this process, it involves development to produce buds from the polyps and later it grows into larvae. Secondly, they can produce sexually too where they attach themselves to another Atolla wyvillei by grabbing them with their hypertrophied tentacle and later pulling themselves towards the mate. Clusterwink Snail is a small snail native to oceans off Australia. Whenever disturbed it produces light in the form of blinking or flash. It will help snail to distract predators. Most of the bioluminescent animals use the lightning property to attract rather than distract, However, Clusterwink Snail works on a different principle. It used Bioluminescence to protect itself from predators. Clusterwink Snail used to lighten its entire shell in the form of on and off whenever it feels intimidated by predators. The property comes from a chemical that snail secretes and have bacteria that is itself bioluminescent. Bioluminescence is a common phenomenon in small deep-sea species. Garden snail is listed as one of the slowest animals in the world. According to the Dimitiri Deheyn, marine biologist at the Scripps Oceanographic Institute in San Diego, “The snail produces light when tapped or around animals that might eat it, even while it’s hiding in its shell,” They also define this trick as Hinea brasiliana in the upcoming study journal of the Royal Society B. Moon Jellyfish one of the beautiful species of Jellyfish usually seen in warm and tropical waters near the sea coast. However, they are visible in all oceans across the world. It is called by several names such as moon jelly, common sea jelly, saucer jelly and violet moon Jellyfish. Moon Jellyfish made up of 95% water and has only one largemouth and digestive system. It is also one of the bioluminescent animals that produce light by some chemical reaction inside their body. These chemicals are known as luciferin and luciferase. When luciferin triggered it gets oxidized by luciferase and hence it will make jellyfish glow in dark places. Moon jellyfish love to eat plankton, fish eggs, and small shrimp. It was discovered by Carl Linnaeus in 1785. Box Jellyfish is one of the deadliest fishes in the world. The species reproduce during the summer where the female one give up the eggs and the male’s species releases sperm into the sea in intervals of 24 hours. According to science, this process requires a lot of energy and some of the jellies killed in the process. In to the wild, the average lifespan is around half a year, and dying soon after they’ve reached adulthood. Black Dragonfish usually seen in deep sea oceanic waters and that too in absolute darkness. It has a light producing photophore called barble. Dragonfish uses lightning to attract its prey and when it comes closer to their fang-like teeth come into action by killing prey instantly. The photophores located at the back of the eye will act as a headlight for catching its prey. Black Dragonfish is mostly seen in the Pacific, Atlantic, and Indian oceans. It is capable of swallow anything that fits into their largemouth. It looks like a torpedo with large eyes and mouth together. There are only a few dragon fish that comes close to the water surface for hunting. The length of dragon fish from 2 to 50cm with an average size of 15 cm. Scleropages famous is the largest known dragonfish with a size of 90cm. Also, read about weirdest looking animals. Motyxia is the only known bioluminescent millipedes mostly seen in the small regions of Nevada mountain range in California. Motyxia is one of the animals that produce poison cyanide. Out of all Motyxia species, the Motyxia sequoiae glows the brightest. Motyxia emits blue-green light and can reach up to 3 to 4cm along with 20 body segments. Females used to be a little larger than males. Dragon Millipede is one of the beautiful pink animals on planet Earth. The glowing of Motyxia is a warning signal for all nocturnal predators. Similar to other millipedes, Motyxia used to feed on decaying plant material but in course of adapting underground life, these species became eyeless. You can also read about the most amazing blind animals. Bathocyroe Fosteri is a comb jelly usually seen in deep sea waters all around the globe. However, they are abundant near the Mid-Atlantic Ridge. It can reach up to 2 inches in height. It is one of the bioluminescent animals named after pilot Dudley Foster. He is the one who collected the first specimen of Bathocyroe Fosteri. Whenever disturbed, it has the ability to produce light through its tissues by producing the right chemicals that will emit flashlights from its chromatophores. It will definitely reduce the probability of attacking predators and act as an adaptation for Bathocyroe Fosteri. Also, read about oldest animal species on Earth. It is one of the bioluminescent animals that are yellow-luminescent. Only a few known marine animals used to glow yellow. Their glowing mechanism is not clear but one thing is clear it does not glow with the help of light-emitting compound known as Luciferin. When disturbed, Tomopteris is known to release bioluminescent particles from their two different organs. It is believed that tomopteris used this to distract predators. Talking about the size, they can grow upto few centimetres in length. Also, read about the most beautiful fishes in the world. How many of these bioluminescent animals do you know? Do share your comments.